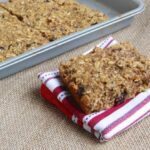 A grab ‘n go breakfast that’s tasty and a cinch to make, without all of the added sugar found in store bought bars. Combine quinoa, applesauce, vanilla, eggs, peanut butter and honey in a small bowl and mix well. Add the remaining ingredients and stir until just mixed. Spoon into a greased 9×13 pan and bake at 375 for 20 min or until golden brown.